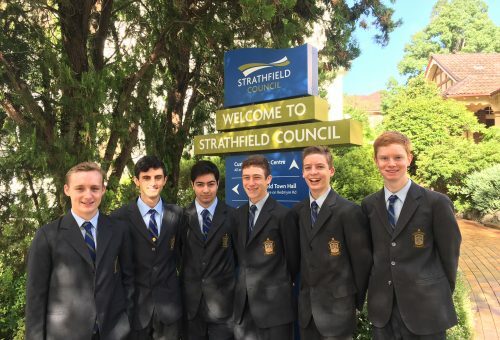 On Tuesday the 7th of March, six St Patrick’s College students, were invited to Strathfield Council Town Hall to participate in a friendly debate against Homebush Boys students. The debate was organised to commemorate International Women’s Week and students were asked to consider the question “In Australia, are we doing enough to support gender equality” – a valuable opportunity to discuss the pivotal role young men play in ensuring that gender equality becomes a reality in Australia. Students were split into affirmative and negative sides and then given the morning to discuss and formulate their cases – what they didn’t know was that the entire debate was to be done in front of an audience of the various Strathfield based girls’ schools! The affirmative side was comprised of Year 10 students Luke Malacco, Edward Carrall and Julian Thomas, while the negative side were Year 11 students Tobias Pickett, Alexander Panzarino and Dimitri Sclavenitis. After the debates students listened to two guest speakers who both spoke about the topic as well as their own life experiences. Congratulations must go to the students involved for their maturity and participation on the day. Special thanks must also go to Ms Lamir for accompanying students on the day and to Ms Daley and Miss Lazkin for organising the student’s participation in the event.